You can now edit your PS3 save files with this new product using an old trademark. Back in the 80s, the Game Genie by Galoob was a physical hacking device that let you mess with the software loaded onto game cartridges. You plugged Super Mario Bros. 3 or whatever into the Game Genie, which then plugged into your NES, and if you input the correct code, you could become invulnerable or have unlimited raccoon flight. Nintendo fought the Game Genie, but it wasn't until the advent of game discs that use of the product lapsed. 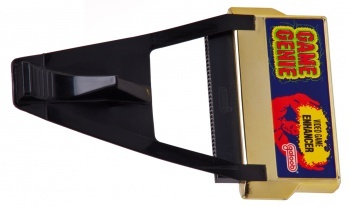 A peripherals company called Hyperkin - makers of some nifty products - purchased the trademark recently, and vowed to bring back the Game Genie. The first step is the Game Genie: Save Editor for PS3, which is available for purchase today for $33 US. The new Game Genie: Save Editor is essentially a USB flash drive loaded with software that lets you edit the save files for popular games. You grab the saves from your PS3, put it on your PC, use the Game Genie software to search for the right variables to edit, plug the drive back in to your PC and voila, instant gold profit. Hyperkin says the software will be able to handle many games such as Uncharted 3, Batman: Arkham City, Final Fantasy XIII-2, and The Elder Scrolls V: Skyrim, and that more titles will be added to the database in the future. "The Game Genie Save Editor for PS3 is a breakthrough for gamers everywhere," said Steven Mar, head of Hyperkin. "The Game Genie Save Editor allows for even the most novice gamers to breeze past the hard or boring parts of games, leveling the playing field for a more enjoyable experience." So for those of you with fond memories of glitching out the sprites in Mega Man or if you've spent years figuring out how to get endless gold in Final Fantasy like this guy, you can now tinker with your PS3 save files to your heart's content. Want to get a complete set of Daedric armor from the start in Skyrim? Pick up the Game Genie: Save Editor for PS3. You could also just play the game. Or, you know, get a decent PC rig and install some mods.